NewsFire 1.5 (v71) is now available for download. In addition to minor compatibility improvements, version 1.5 brings a new modern and clean look to NewsFire. This includes a more prominent “Next Item” button for easy perusal of the news and a slimmed down status bar. 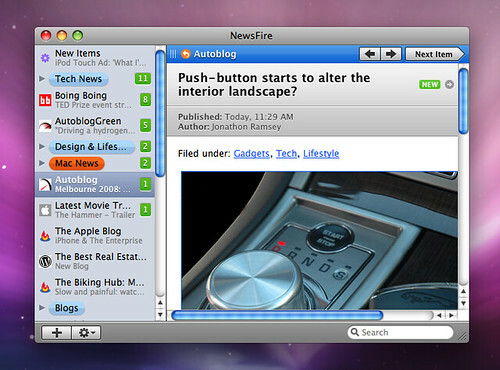 NewsFire 1.5 is a free upgrade. Any plans to offering an option to fetch images for offline reading? Sometimes I read RSS feeds when I don’t have an Internet connection. I love NewsFire and I’ve used it for a long time, but have recently been playing with newspipe which fetches the articles & images and pipes to procmail to sort into folders and then I can read with any mail client. It is a somewhat clunky solution and it would be nice to have NewsFire fetch the images when it gets the content. Any update on a localisation of the application ? I’m currently moving some apps to a new machine (including NewsFire!) and I need to know how to move the data to the new machine. I know I can export/import an OPML file but I’d like to keep my groups, my flagged items, etc. Any help would be appreciated. It’s my favorite news reader–despite the frequent crashes when videos are displayed. I also have the FeedBurner favicon issue, where I see the flame icon for the following feeds while using the latest build of the software: Slashdot, Macworld, and TorrentFreak. I’ve had a thought that would make NewsFire even better. I already use it constantly but I would love to have the ability for NewsFire to ignore certain headlines either temporarily or permanently. This could be done with regular expressions or something simpler. Two use cases are (1) I don’t care about Joe Smith’s latest stupidity and never want to see another article about Joe Smith. (2) I’m going to watch a game/race/tv show/whatever I recorded tonight, but I don’t want to see information about it before I get around to watching it so ignore items from from time1 to time2 on these days. I realize that (1) is kind of solved by smart feeds, but it’s not all that seamless. You have to either just lump all of your feeds together or create a rule for each one. As far as I know smart feeds don’t solve (2) since you can only specify within the last X time not not within. Anyone else have an issue with Newsfire and Firefox? When I have both open, they inevitably both freeze. Could be a different issue, but any advice? Is there a way to make NewsFire compatible with Google Reader exported XML/OMPL file? Although, I was able to import on NewsFire OSX Tiger the OPML file, in Leopard it seems not being possible to do the same. The workaround for Tiger (which does not apply to Leopard) was to rename the google-reader-subscriptions.xml extension to .opml. It would be great to enable the import for the Google Reader generated file. I have deleted all feeds from my NewsFire and when I export the feeds there are still 3 that are showing up. The reason I know this is one is for a secure site I don’t have access to anymore and it continually asks for the password to login. How/where can I get these feeds deleted from. I think it would be great if you added a syncing API, so web RSS reader developers could update their scripts so Newsfire would be able to sync feeds. Newsfire users would be able to edit their settings, adding-in the URL (and user credentials) of their web readers’ syncing script, allowing Newsfire to push and pull data to and from the server.